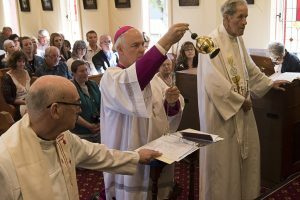 After eight months of extensive restoration, St Patrick’s Church, Akaroa, was reopened on Labour Day Monday with Bishop Paul holding a Liturgy of Thanksgiving. 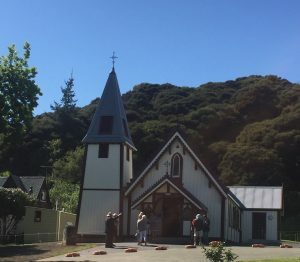 Built in 1864 via Irish-born John Cullen, St Patrick’s Church is 154 years old, an iconic landmark of Akaroa and site of the beginnings of Catholic faith in the South Island. 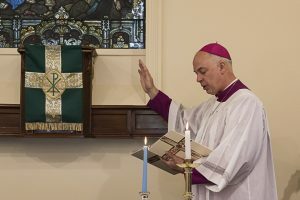 The $800,000 project included a full restoration of the church with major work being done to the foundations, floor, roof, cladding on the tower, insulation and installing wiring throughout the building. Borer, which had infested much of the woodwork, was eradicated. Also included in the restoration were the procurement of kauri pews from the Catholic church in New Brighton that date back to 1911. 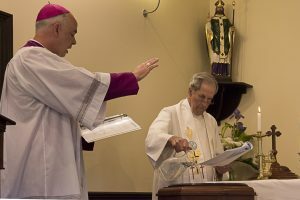 In his homily Bishop Paul said “So many generations of people have gathered here to pray, to commune with God, to listen to the Word, to be fed by the Eucharist and to receive the various sacraments of the church which are availalbe to us to give us the graces we need to be able to live this life well. For this place has been inhabited by holy men and women and their holiness has been absorbed by the very bones and boards of this Church. … When we are at our most holy then there is something deeply attractive about us which in turn makes people want to know what we have that they don’t. And in our very nature we want to share what we have with them, which is the Good News, the message of Jesus Christ, the gift of himself to us here on this earth and the promise of eternal life. All of this is captured in this church which has stood here for 152 years, this small church which has given witness through good times and bad to the Good News. This is what we are celebrating today as we open it after its time of renovation”. “Our Faith is expressed in action and what we do today is a reflection of this. This building, beautiful as it is, is not an end in itself, but a part of the history of this place. 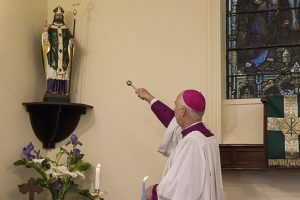 Those who have worked for this have done so for those who are to come, just as our forebears in the faith did,” he said. 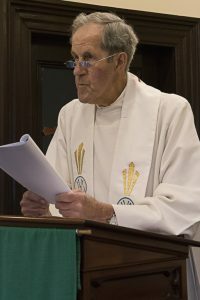 Parish Priest Fr Paul Shannahan SM gave special thanks to the local Anglican and Presbyterian communities who made Trinity Hall available for Mass every Sunday whilst St Patrick’s was closed for work. 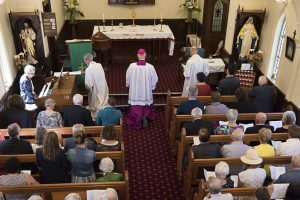 “This has further enhanced the closeness to our fellow Christians here at Akaroa. This restoration has been in progress for over a decade and everyone is full of admiration for the final product,” he said. 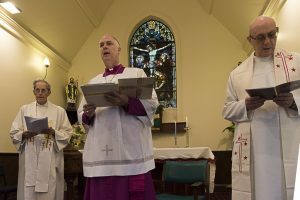 More than 100 parishioners and visitors attended the liturgy including members of the parish council, parishioners from other Christchurch parishes.